The Sith, collectively known as the Sith Order, were an order of Force users who utilized the dark side of the Force in an effort to gain power over the galaxy. The Sith were the ancient enemies of the Jedi Order and fought numerous wars with them for thousands of years. Formed thousands of years prior to the Clone Wars, the Sith were the ancient enemies of the Jedi Order. Established by a rogue Jedi, the Sith sought further knowledge and power through learning the dark side of the Force. Eventually, this Jedi was able to amass a sizable following, all of whom adhered to this new philosophy that embraced the dark side. This schism in the Jedi Order led to an event known as the Hundred-Year Darkness, in which the Jedi and the newly-founded Sith Order, once brothers and sisters in the Force, fought against one another for power. The civil war ended in the defeat of the Sith, who fled from known space. Unbeknownst to the Jedi however, the Sith settled on Moraband, a world of red sands, where they rebuilt in secret to wait for another chance to strike. As the Sith Order grew, they constructed massive temples and tombs on Moraband in a location known as the Valley of the Dark Lords. The Sith built empires on the backs of their slaves and fought wars against the Jedi for control of the galaxy. During these wars, they built massive superweapons powered by giant kyber crystals. During one such conflict, the Jedi and Sith fought on the planet of Takodana. The pirate Maz Kanata later built her castle on top of the legendary battlefield. Arcann and his twin brother Thexan were born as princes to Valkorion, and trained from a very early age in combat. Both of them were sensitive to the force, and were able to use it very effectively in combat. As they grew, both built and used lightsabers as their primary weapons, and upon reaching adulthood, were sent by their father to battle and dominate worlds. Arcann soon grew angry of his father’s lack of affection or interest in him and his brother as anything more than tools. Regardless, he and Thexan led the Eternal Empire’s armed forces to war against the Galactic Republic and Sith Empire, driving them back almost to the brink of extinction. Arcann was wounded severely in the face and lost his left arm while waging a battle on a Sith planet, and soon after received a new jaw casing that covered the left side of his face, as well as a cybernetic left arm. Arcann and Thexan eventually returned to Valkorion, presenting lightsabers of both Jedi and Sith as trophies of their successes in battle. 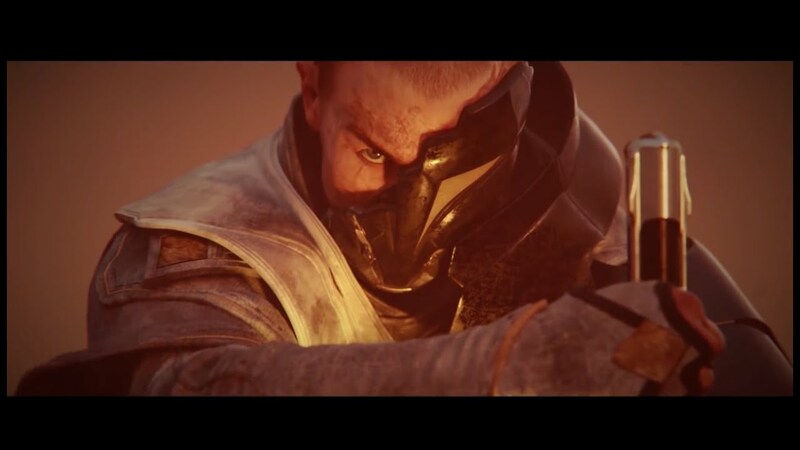 When Valkorion turned away without so much as a glance at the weapons, the light of the dark side ignited in Arcann’s eyes as he became furious at his father’s lack of caring. Irate, he ignited his lightsaber and leaped at his father, intending to cut him down. Thexan, using the Force, pulled Arcann back in an attempt to prevent his father’s death. Arcann, furious, turned his fury on his brother and dueled with him briefly. Arcann lashed out and struck his brother across the torso. Thexan glanced at his brother with a look of resignation, and the light of the dark side faded from Arcann’s eyes as he realized what he had done. He cradled his brother in his arms as Thexan died of his wound. Looking up, Arcann saw his father standing over him, reaching his arm out and imploring him to come with Valkorion. Anakin Skywalker is considered “the Chosen One” of the force; whom is supposed to destroy the Sith. Anakin Skywalker was born without a father and lived most of his life on Tatooine with his mother, Shmi. When Qui-Gon Jinn came to the planet looking for parts for their ship back to the Jedi Council, Anakin won them the parts and also his freedom, but only with one flaw in the plan — his mother had to stay on Tatooine as a slave. Years later, Anakin became the apprentice of Obi-Wan Kenobi and married the ex-queen of Naboo, Padme Amidala. Near the end of the Clone Wars, Anakin became very obsessed at saving his family. Learning that his wife and unborn child were going to die though a vision, Anakin was determined to find the power save his loved ones. At this moment, Sith Lord Darth Sidious made Anakin join the newfound Empire as his new Sith Apprentice, Darth Vader. Anakin killed most of the last remaining Jedi in the galaxy, except for Yoda and Obi-Wan. Obi-Wan tried to kill Anakin, but only left him near the lava planet of Musafar badly injured. Anakin survived, through the mechanations of Emperor. More machine than man, Anakin forever became Darth Vader and served his master as the Empire’s Mailed Fist. Along with the entire Star Wars universe, Darth Vader (or Anakin) was created by George Lucas. However, at the time Darth Vader was the main portrayal of the character, than Anakin Skywalker (but it has been said that George worked on Anakin’s model before they started Vader). Vader’s mask was drawn by Ralph McQuarrie who drew the concept for the Darth Vader space suit. After many alterations to Vader’s mask, Ralph finally got a design that George liked, and soon Brian Muir started to design the rest of Vader from the head down. With the success of Star Wars IV: A New Hope, George Lucas began to look for a writer to help him with the fifth, technically second, movie. Writer Leigh Brackett helped George create the second installment of Star Wars, and everything was perfect, except that the fact that Vader was not going to reveal that he was the father of Luke. Before the movie script was finished, Leigh Brackett died of cancer, so it was left for George to write the script by himself. In the end, Darth did tell Luke that he was his father. George began looking at a backstory for Anakin and created the entire story with Anakin having been the student of Obi Wan Kenobi, and the late Qui-Gon. The story was clear that Anakin would loose himself to the dark side through a series of events, and eventually become Darth Vader after being badly wounded during the final battle against Obi Wan. Which ultimately completed the “Saga” of Star Wars, episodes 1-6. Darth Vader found a secret apprentice during the reign of the Empire. On a mission from Palpatine on suspicions of a Rouge Jedi on the planet Kashyyyk, Vader discovered this apprentice. His father Kento Marek, the Rouge Jedi, had escaped Order 66 and had traveled through many planets on his way to Kashyyyk were the Rouge had eventually stayed. After confronting Kento and killing him, Vader took the boy from the prying eyes of Palpatine. After years of training, Vader saw it fit to let his apprentice to hunt down the last of the Jedi. When Starkiller completed his tasks, Vader was ready to initiate his plan to destroy the Emperor. Unfortunately, the Emperor found out and had tailed Starkiller’s plane until reaching Vader’s private spacecraft. When the Emperor arrived, Vader betrayed and killed his Starkiller to show his loyalty to his master. He left his Apprentice alive though and when the Emperor left, Vader retrieved Starkiller from the depths of space. of the Emperor’s plan to expose the Empire’s enemies. Vader would later capture the Rebel Alliance and defeat his apprentice once more, but that would prove to be his undoing. Starkiller survived and confronted Vader and the Emperor in the Death Star, sacrificing his life to allow the Rebels to fight another day. Because of Starkiller’s actions, the Rebel Alliance was formed and ready to engage the Empire in a vicious Galactic Civil War. Three years after the Death Star had been destroyed, the Empire destroyed the Rebel Base on Hoth VI. The Empire had gained strength, so as Luke traveled to Dagobah, in whose swamps Yoda now made his home, to become Yoda’s apprentice and continue his training in use of the Force, Han Solo and Leia Organa traveled to Cloud City, in the Bespin system, to meet Han’s old friend Lando Calrissian. However, Vader had tracked the heroes to Cloud City with the help of the Mandalorian bounty hunter Boba Fett and forced up a deal that meant that the Baron Administrator betray them, and the Dark Lord captured them. Vader, wanting to capture Skywalker, decided to test the carbonite freezing on Han Solo, who proved to have a price on his head thanks to Jabba the Hutt, and Fett took him to Jabba. Luke reached Cloud City to save Han or Leia — but he would eventually engage Vader in a lightsaber battle. Vader’s power was much more vast than Luke’s, but he did not kill Luke because he wanted Luke to turn to the Dark Side and become an ally of the Empire. They fought, and Vader eventually slashed off Luke’s hand at the wrist, over a balcony, causing Luke to lose the lightsaber that Anakin had meant for him long ago. Vader eventually revealed to Luke his true parentage, but Luke chose death over life as Vader’s son, and he let go and fell. He barely survived and escaped Vader and the Empire, much to the Dark Lord’s dismay. All the while, Anakin Skywalker had been fighting that which made him Darth Vader. Successfully overcoming what had made him Vader, Anakin seized the Emperor and threw him into the Death Star’s power core. Unfortunately, the lightning short-circuited Anakin’s cybernetics. He then died after killing the Emperor and saving his son, who unmasked him to find that his father had still been essentially human all the time. Sensing that his new apprentice is in danger, Palpatine travels to Mustafar and finds Vader still alive. After returning to Coruscant, he rebuilds Vader’s ruined body with the black armored suit from the original trilogy. Palpatine then tells Vader that Padmé was killed in the heat of Vader’s anger, breaking what remains of his apprentice’s spirit. Vader is last seen watching the original Death Star’s construction, with Palpatine and Willfins Tarkan at his side. Darth Vader makes his first appearance in the first installment of the original star wars trilogy, Star Wars. He is a ruthless cyborg serving the Galactic Empire who is tasked along with Imperial commander Grand Muff Tarken to recover the secret technical plans of the Death Star, which were stolen by the Rebellion Alliance. Princess Leia Organa has secretly hidden the plans inside the Astromech droid R2-D2 and has sent it to find Jedi Master Obi Wan Kanobi on the nearby planet of Tatoonie. Vader tortures Leia, but she resists revealing anything. During Leia’s rescue, Vader fights and kills Obi-Wan in a lightsaber duel and later attempts to kill Luke when the Death Star is about to fire on the Rebel base in Yavin 4. However, Han Solo sends Vader spiraling off course, allowing Luke to destroy the Death Star. In the 1980 sequel The Empire Strikes Back, Vader leads the Imperial starfleet’s invasion of the Rebel base on Hoth, whereafter the Rebels escape. He later confers with the Emperor, who tells him that Luke has become a threat to the Empire and must not become a Jedi. Vader persuades the Emperor that Luke can be turned to the dark side of the force. Vader negotiates with Cloud City administrator Lando Calrssian to capture Han, Leia, Chewbacca, C-3PO and R2-D2 on Cloud city, and lure Luke into a trap. He tortures Han, freezes him in carbonite and delivers him to bounty hunter Bobba Fett, but Calrissian helps Leia, Chewbacca and the droids flee. A lightsaber duel ensues in which Vader cuts off Luke’s right hand, disarming him. Vader reveals that he is Luke’s father, and implores him to come to the dark side so they can to rule the galaxy together. 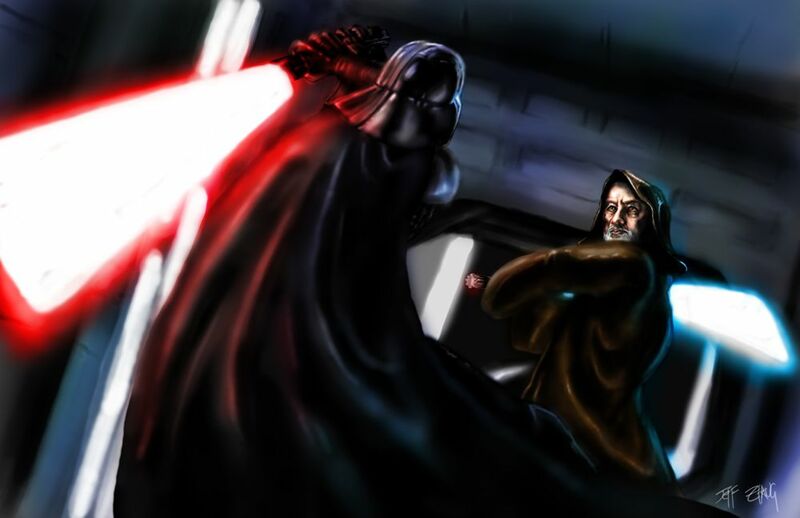 After Luke escapes with his allies, Vader telepathiclly tells Luke that it is his destiny to join the dark side. In the 1983 sequel Return of the Jedi, Vader travels to the second Death Star and orders its commander, Moff Jerjerrod, to advance its construction. He meets with the Emperor, who assures him that they will together make Luke come to the dark side. Luke attempts to implore Vader to leave the dark side, but is unsuccessful. Vader brings Luke onto the Death Star, where the Emperor tempts Luke to the dark side. This leads to another lightsaber duel between Vader and Luke, in which Vader discovers that Leia is Luke’s twin sister and threatens to turn her to the dark side if Luke will not submit. Luke, enraged, subdues Vader and cuts off his father’s robotic right hand. The Emperor tells Luke to kill Vader and take his place, but Luke refuses, declaring himself a Jedi as his father had been; the Emperor tortures Luke with force lighting. Moved by his son’s pleas for help, Vader kills the Emperor into the Death Star’s reactor shaft, but is mortally wounded in the process. He then asks Luke to remove his mask, and after telling his son that there was good left in him after all, he dies peacefully, having redeemed himself. Luke escapes the Death Star with his father’s remains, which he later ceremonially burns in a pyre. As the Rebels celebrate the destruction of the Death Star and the fall of the Empire, Luke sees his father’s spirit, standing alongside those of Obi-Wan and Yoda.